Morlaix is on the northern coast of Brittany, to the south of Roscoff and a few kilometres inland at the southern end of Morlaix Bay. 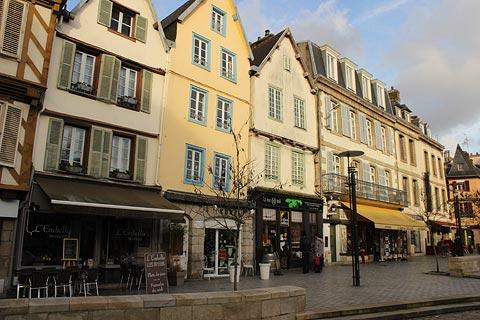 There is a great deal of interest to discover in this Brittany town, with an attractive port area and a quite extensive historical centre with lots of interesting buildings. 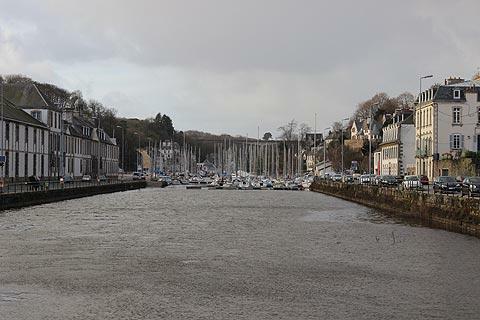 We suggest you park somewhere near the port when you visit, since parking is easily available and this is well placed to start your visit to Morlaix. 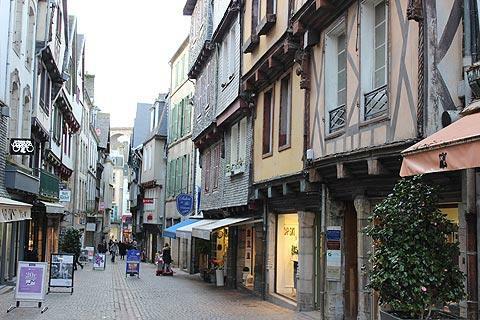 Morlaix originally developed around the port and it is still a hub of activity. Impressively grand houses can be seen along both sides of the port that were built with the proceeds of the profitable linen industry and other port activities, mostly in the 18th century. 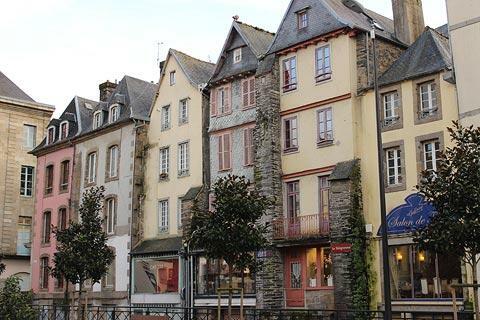 This area of Morlaix is always bustling in summer, its popularity with pleasure craft helped by the position of the port almost in the centre of the town. After walking along the Quai de Léon and the side of the port you can continue towards the main town centre: this is easy to find because it is just beyond the largest viaduct you have ever seen! 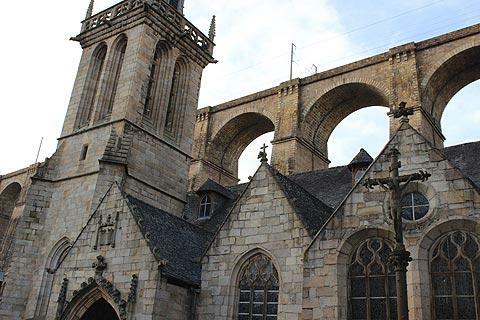 This viaduct was built using the local pink granite in the 19th century to allow trains to pass between Rennes and Brest and dominates the town and the port. 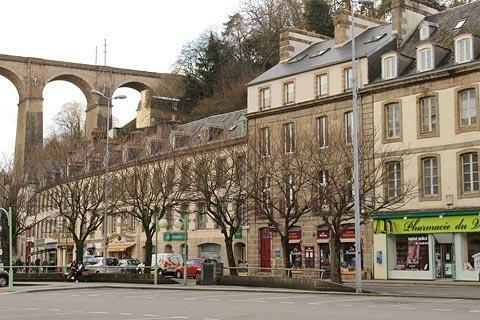 When you see pictures of Morlaix they are often dominated by the viaduct, giving the impression that it overshadows the whole town. In fact it is between the two separate areas of Morlaix - the historic town and the port - so you only really notice it when passing from one area to the other. And although it is rather big it is not unattractive - so don't let it deter you from visiting! The viaduct was built in the 1860's and is 58 metres high, 292 metres long and has 14 vast stone arches. 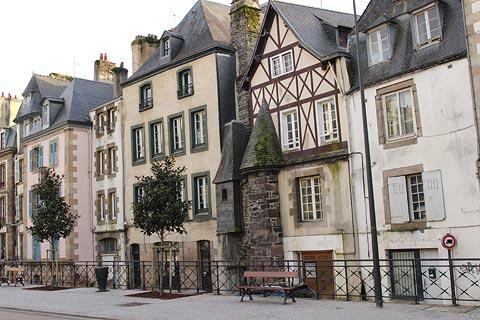 Beyond the viaduct you reach the historical centre of Morlaix which is very pleasant to explore, with open squares and narrow streets lined with medieval houses. First take a look at the Church of Saint Melaine which is up a broad flight of stairs next to the viaduct. This 15th century church has a spire that was added in the 19th century and contains several interesting artworks, mostly statues from the last five centuries. 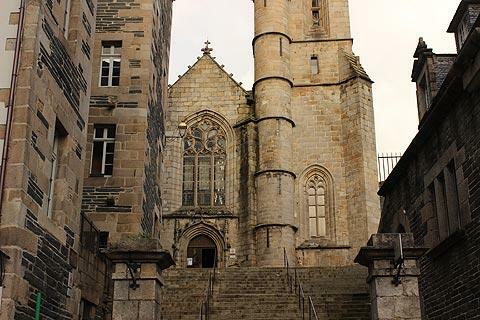 The Tourist Office in Morlaix is next to the church. Behind the church, first follow the staircases up the hill (Venelle aux Prêtres and Venelle du Calvaire) to reach an attractive viewpoint across Morlaix, then redescend and follow the Rue Ange de Guernisac which has several interesting medieval houses and leads you back to the town centre and the Place des Otages with some imposing 16th century town houses. The Place des Otages is named for the hostages who were brought here on 26 December 1943 after an attack on the Nazis, before being deported to Nazi concentration camps. 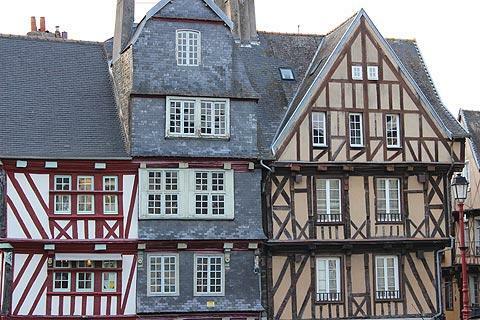 Throughout Morlaix historic centre you will see that some of the medieval houses are half-timbered and others have facades hung with tiles in the traditional Breton fashion. Many of the half-timbered buildings, typically built in the 16th century, are painted in bright colours which further adds to the charm, while others feature interesting wooden carvings and decorative features. There are various streets to explore south of here with the Grand Rue and the Place Allende the most attractive among them. 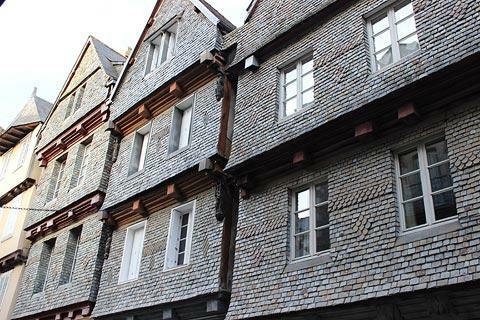 Grand Rue in particular has several lovely 16th century houses. The best known of the medieval houses is on Place Allende and called the 'Maison de la Duchesse Anne'. Built around 1525 you will best appreciate the design and decoration if you visit the house, it costs less than 2 euros and is highly recommended (open for visits May to September). It is known as a 'lantern house'. 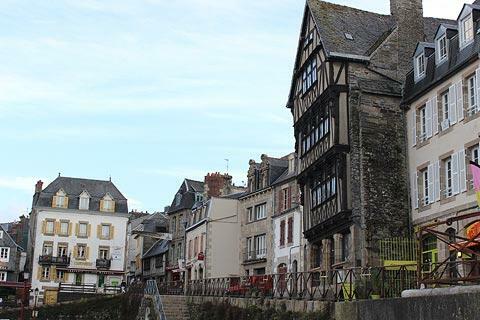 Several of the 16th century houses in Morlaix are known as 'lantern houses': the 'lantern' refers to an interior courtyard in the house which contains a fireplace and a staircase to the upper stories and allows light to enter the building. On the hill to the other side of Place Allende you can reach the site of the ancient castle by following the 'escaliers du château'. Although the castle itself was demolished in the 16th century the Square du Chateau has lovely views. Continuing south-east along Rue d'Aiguillon you reach the Jacobin convent, built in the 13th century and where Mary Queen of Scots passed the night in 1548. The convent now houses the town's Museum of Fine Arts. Another 100 metres along the Rue de Paris you can see the Church of Saint-Mathieu, best known for the renaissance style tower which dominates the front of the church. After exploring you will probably now be ready to enjoy lunch in one of the many restaurants in the town. There are a good selection, and lots of them are not creperies (you will find that many towns in Brittany have lots of creperies but not many other restaurants). Suitably relaxed you will now have the energy to follow a route proposed by the Morlaix Tourist Office that explores the west of the town and includes various small historic landmarks such as a chapel, a washhouse and a church. See the guide map from the tourist office for details or follow Rue Longue to the left of Rue Gambetta (near the Post Office). In the bay at Morlaix there is an interesting chateau which is now a sailing school. This is the Chateau du Taureau, built in the 16th century to defend the town against the English after they had invaded Morlaix in 1522. 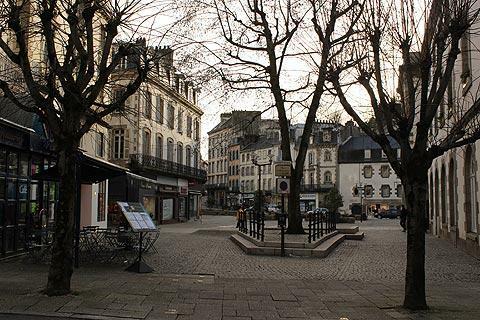 In Morlaix itself, a large music festival (modern music, not the traditional music you will sometimes come across in Brittany) is held each April that attracts more than 10,000 visitors to the town. After visiting the town take a trip out to the little villages at St Thegonnec, Lampaul-Guimiliau and La Roche, where the churches each have their own distinctive and interesting carvings of various dramatic scenes from the bible and history, well worth the detour. See also churches 'enclos paroissiaux'.